Two well-known figures from either side of the divide – Klaus-Dieter Borchardt of the European Commission and Russian energy economist Professor Andrey Konoplyanik – discuss the future role of gas, the Quo Vadis? study, and the importance of economically driven solutions in an often politically charged world. On 10 July, writes Professor Andrey Konoplyanik, the 33rd round of informal Russia-EU Consultations on EU gas regulatory topics (Consultations) combined with 26th meeting of the EU-Russia Gas Advisory Council’s Work Stream on Internal Market Issues (GAC WS2) will take place in Saint Petersburg at the office of Gazprom Export. Since the end of 2011 the GAC has reflected on the key issues for both parties, including how the EU, Russia's key market, sees the future role of gas. They discuss how the new evolving EU paradigm “renewable electricity AND decarbonized gas” can be developed for the mutual interests of the two, since both parties are bound together by cross-border, long-distance large-scale infrastructure. The current EU vision of the future role of gas is here considered by Klaus-Dieter Borchardt, Director of the Internal Market, DG Energy, Co-chair of GAC, and Andrey Konoplyanik (pictured below), co-chair of WS2 GAC, who has also prepared an introductory article for this conversation. The following text was first published in Russian in Neftegazovaya vertical (The Oil & Gas Vertical). 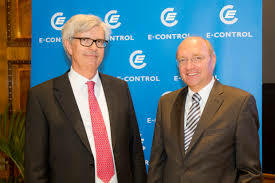 On 2nd September 2009, at the Alpbach 2009 Economic Symposium “The future of security of supply – how does the ‘gas crisis’ affect European energy policy?”, I debated with the then Chairman of the Austrian Energy Regulatory Agency “Energy Control” (E-Control) Dr Walter Boltz (below left, with Klaus-Dieter Borchardt) the issues of the forthcoming Third EU Energy Package (TEP), due to come into force the next day. It was well-known that W. Boltz was one of its architects. I raised at the panel a number of justified concerns of non-EU gas producers such as Gazprom regarding EU gas market design and the incremental risks that it creates for the existing contractual structures of external gas supplies/suppliers to the EU. Immediately after that debate, in the margins of the seminar, W. Boltz proposed that I should organize a meeting between Gazprom representatives (as a sole exporter of Russian gas to the EU) and energy regulators of EU Member States where the latter could explain their views regarding design of the emerging internal EU gas market in response to the objections from the Russian side that will help to dispel such “misunderstandings”. In my view, one meeting might not be enough to clarify all such issues in question. So I counter-proposed to W. Boltz that it might be more helpful for both parties to establish a process of regular informal communications to anticipate and answer the justified concerns of the Russian side in regard to emerging regulatory system of the common internal EU gas market. Adoption of TEP was to be followed by development of adjoining regulatory documents, both legally-binding and non-binding, indicative (Framework Guidelines, Network Codes, Gas Target Model (GTM), etc.) which shall, from my view, be based on the balance of interests of import-dependent in gas the EU and its key non-EU gas supplier(s), especially since historically such long-term large-scale cross-border gas supplies have been undertaken through the capital-intensive immobile gas infrastructure. And from that point of view both Russia and the EU have been the mutually-dependent integral parts of the (what I have been entitling as) “Broader Energy Europe” – the geographical space covered by such infrastructure which includes all EU and non-EU Europe, part of Asia (Russia’s Western Siberia, Central Asian and Caucasian states, Turkey) and Northern Africa. We agreed to establish the process of informal consultations between Russian energy experts and energy regulators and transmission system operators (TSOs) of the EU Member States with representatives of the European Commission on the regulatory issues surrounding the single energy market. We started talks in January 2010 under the co-chairmanship of W. Boltz and A. Medvedev (Deputy CEO of Gazprom), and these continue. Within two years the efficiency of such process was proved, and in end-2011 an informal intergovernmental structure was established under the auspices of Russian Minister of Energy and the EU Energy Commissioner – the EU-Russia Gas Advisory Council (GAC) with three Working Groups: on Forecasts and Scenarios, on Internal Markets, and on Infrastructure. 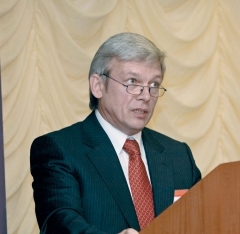 The then Director-General of DG Energy Philip Lowe and Russian Deputy Energy Minister Anatoly Yanovsky were appointed as co-chairs of GAC. At its very first meeting in October 2011, the aim of GAC’s activities was formulated as “to jointly diminish risks and uncertainties [between Russia and the EU] to the tolerable level”. W. Boltz and myself were appointed as Co-Chairs of Work Stream 2 “Internal markets” (WS2). On 3rd May 2018 we navigated the 32nd round of Consultations combined with the 25th WS2 GAC meeting. When the new commission came into office and P.Lowe retired, Professor Dr Klaus-Dieter Borchardt, Director of the Internal Market, DG Energy was appointed as EU Co-chair of GAC. In 2014, after Crimea and Ukraine, GAC meetings were suspended (the EC saw these as taking place at the “political level” of Russia-EU co-operation which was sanctioned in many areas, including GAC), but this did not refer to the Work Streams since their activities were perceived by the EU as reflecting the “technical level” of co-operation. Much of support for ongoing WS2/Consultations process came from the personal position/attitude of both K.D. Borchardt and W. Boltz. They well understand that regardless of the areas between Russia and the EU where we “agree to disagree”, dialogue between the two parties must continue, owing to their objective interdependency in the energy sphere. And especially in gas due to above mentioned reasons, since Russia and the EU are historically (now for already 50 years) linked by large-scale long-distance cross-border capital-intensive immobile infrastructure, which is not the case for oil or coal. So, despite political fluctuations at the top level (say, at the level of “the head”) we have continued constructive discussions on sensitive issues on the working level (at the level of “the neck”). I know that both gentlemen have a mixed reputation in my country in professional circles reflected by their role in the activities that have directly influenced export of Russian gas to the EU. W. Boltz, as one of the masterminds behind the TEP, has accumulated all the negative perceptions – regardless of their merits – in regard to the TEP with all its implicit “liberalization risks”. These perceptions concentrated on the negative consequences of TEP for then existing dominant contractual structure of Russian gas supplies to the EU and did not look at potential additional benefits of the new (evolving) EU internal gas market architecture to the new (evolving) type of Russian gas supplies. K.D. Borchardt is thought of by some people in Russia as “South Stream’s killer” (which I do not agree with) and now trying to slow down “Nord Stream 2” by changing EU legislation aimed de facto against this particular project, and favouring the clearly articulated position of US and Ukraine. (Here Klaus-Dieter and I hold radically different views/positions). We also differ on the impacts of the regulatory changes proposed in DG-Energy's recently published Quo Vadis project, etc. But we always need to clearly distinguish the areas where we can agree from the areas where we “agree to disagree”. And thus to try to expand, in the first case, the area of “common denominator” for our co-operation based on a “win-win” approach. And to continue, in the second case, an extended deep professional – and, what is much important, an informal – dialogue, regardless of the political turbulence between the two parties. Mutual understanding is the only sustainable basis for long-term beneficial co-operation in the case of gas relations between Russia and the EU. Since the very beginning of Consultations/WS2 process, its key agenda items have been evolving. We first started, as was initially proposed by W. Boltz, with the clarification of the operational consequences of TEP on Russian gas supplies to the EU, since much of TEP regulatory documents were prepared on the “learning by doing” basis, as W. Boltz himself would say. Just one simple example from the list: one of the proposals on TEP implementation from one of the EU consultants was to enforce transfer of ALL long-term supply contracts to the EU (which then dominated both in EU import and domestic supplies), with their delivery points (in the case of Russian gas supplies) deep within the EU at the borders of the EU member-states – within just a six-month transition period – to delivery at the (yet to be established in most cases) virtual trading points within the newly established “market zones”. It was to be proved by the Russian side (and this really took some time) that this would create a chaos in gas supplies to an import-dependent EU and will destroy security and stability of the EU gas market. In 2013-2016 WS2 has mostly concentrated on the infrastructure issues of development of Network Codes to TEP. This is Capacity Allocation Network Code on Incremental and New Capacity (CAM NC INC) and Network Code on Tariffs (TAR NC), which were adopted and came in force early 2017. In this area we have been, first and most, co-operating on the implementation of the principle presented in Art. 13.2 of the Third Gas Directive, that if there is a market demand for the new capacity (which best can be tested through the “open season” procedure), “TSO shall invest”. We have been intensively discussing with EU colleagues the issues of financeability and manageability of the newly developed regulatory procedure. This is why I am still in disagreement with the reservation of a portion of technical capacities (20% in case of existing pipelines, 10% in case of new pipelines) for future short-term potential shippers in CAM NC INC since it was left unclear who will pay for it which, in turn, might put incremental financial burden on the long-term shippers whose capacity booking will make construction of new capacity possible. Last year we dealt mostly with the Quo Vadis project as a topical issue. And since this year WS2/Consultations will concentrate on the future role of gas. The whole 2017 was the year when we paid most attention in WS2/Consultations to the “Quo Vadis?” [Latin: "Where are you going?] . Why was Quo Vadis taken so seriously by market players? Because it was presented and was thus perceived as not just an “intellectual exercise”, not just “a study”, but as a draft roadmap to a Fourth Energy Package. Moreover, there are two different types of “studies” with different roles and consequences for business: quantitative assessments (non-binding scenarios) and proposed regulatory changes (changing motivation of market players). There are quite a lot of studies of the first type. But much more important are the fewer studies of the second type, and Quo Vadis is from this group. Quo Vadis was initially aimed to assess efficiency of finally developed through 2010-2016 integrated internal EU gas market regulatory system based on now full TEP documentary package (TEP itself with three key documents for gas as of 2009, six Network Codes amalgamated their initial composition of twelve, GTM, etc.). But in the end Quo Vadis proposed a number of regulatory changes which, from my view, will not only radically change the current TEP-based architecture of the EU gas market, but will clearly erect economic and administrative barriers to Russian gas supplies in central, east and southeast Europe. These are the former Comecon countries where since 1960s all gas infrastructure has been developed for the supplies of Soviet/Russian gas and not too much alternative gas infrastructure has been developed since these countries became EU Member States. Moreover, I treat Quo Vadis regulatory proposals as a way to squeeze out Russian pipeline gas, which is cheaper to deliver to the EU than imported LNG, mostly from the US. Contrary to the terms of reference, this will worsen EU welfare since the wholesale gas prices in the EU will go up. Quo Vadis scenarios were proposed for consideration and are not a “road map”, though I still have concerns that it might be taken by the new EC as “Terms of Reference” (ToR) for the “Fourth EU Energy Package”. Full-TEP-based regulatory system is still evolving so to propose radical changes now would be at least counter-productive, in my view. And especially if they predetermine discriminatory consequences for import-dependent Europe's chief supplier. First and foremost of these negative ideas is a zero-sum approach which proposes to increase EU welfare at the cost of non-EU suppliers. For instance, tariff reform proposes to increase entry tariffs into the EU gas network. Combined capacity-commodity scenario proposes to increase short-term quotas (reservations of technical capacities for short-term shippers) from current 10% (for new/incremental) and 20% (for existing) capacity up to 50% in both cases and, moreover, to sell up to 50% of gas supplies at the virtual trading point at the first market zone at the entry to the EU. On top of this, the upstream-downstream strategic partnership, which scenario has appeared as if in respond to the comments of the Russian side, de facto proposes such “co-operation” on the basis of EU rules, i.e. in the form of implementation of EU acquis in Russia (well-known concept of “export of EU acquis”). So we have a “mixed” - both “positive” and “negative” - items in the agenda at our WS2/Consultations meetings: the points where we still disagree, like Quo Vadis and particularities of some Network Codes, and the points where we can, though not necessarily would, agree, like the “Future role of gas”. The key item on WS2 agenda for 2018-2019 became the topic, which have the prospects of further putting closer Russia and the EU. This topic is “the future role of gas”, based on (initiated by) the vision that was often presented in different public fora by K.D. Borchardt as the key architect in the EC of the EU internal energy market. At end-January 2018 W. Boltz drew my attention to video-interview given by K.D. Borchardt to the Florence School of Regulation. Then a series of similar presentations by K.D. Borchardt on the issue of future role of gas followed. He spoke on this few days later in Vienna at the European Gas Conference. These views seems to present sort of new vision of the EC and Walter and I agreed that this might pave the way to closer co-operation between Russia and the EU as it explains the EC's vision of the broader role of gas, including Russian gas, in the EU energy future. And that it might take the central part of the WS2 agenda for 2018-2019 as a potential “common denominator” issue. This is why W. Boltz and I, as WS2 Co-chairs, invited K.D. Borchardt to present this vision at the WS2 meeting, which took place on May 5 this year in Brussels, where we started an intensive discussion of the parties on the different aspects of the “future role of gas” issues. This discussion will continue at the next WS2/Consultations meeting on July 10 in Saint-Petersburg and further on. This is why I have asked K.D. Borchardt to explain to a broader professional Russian audience his vision of what can be considered as an update to a more reasonable (from energy economics perspective) vision of the future role of gas, deviated back to the more balanced from a marginal “all-electric” vision which has been dominating within the (political elites of the) EU until recently. What is most important, from my view, is a clear articulation of deviation from a recently dominant economically marginalist view of all-electrical - electrons only - world (“digital, electrical, renewable”) to a more rational, more balanced view of the EU energy future consisting of effective combinations of electrons and molecules. I explain this shift by a three-step movement similar to “pendulum effect”: from a balanced, to an extreme and back to balanced vision of the future role of gas. The starting point is a future consisting of both molecules and electrons. But in import-dependent EU, molecules were coloured in the colours of national flags of foreign states and the resource rent transfer issues thus were of high political importance and sensitivity. Since the Russia-Ukraine transit crises, gas imports from Russia have a negative association in the EU. Moreover, it seems that it were mostly “electrical people” who dominate the development of a liberalised energy market (it is the same “team” of ideologists who liberalized UK telecom, then continental EU electricity, then continental EU gas). This twisted the vision of EU energy future from a balanced to a marginalistic view, based on perception of all-electric world. Key reasons were decarbonisation (Paris Agreement COP-21) and security of supply (SOS), aimed to substitute imported Russian molecules (fossil and thus non-green) by domestic electrons (renewable and thus green). At one of the recent WS2/Consultations meetings Stephan Kamphues, Chairman of pipeline operators' group ENTSOG and Co-chair WS3, has mentioned that it has been a general perception within the EU that its energy future is “digital, electrical, renewable”. This perception seems now to be wrong (at least from the statements of K.D. Borchardt). It seems that the vision of the architects of EU energy regulatory system began to move to a more balanced vision again and presents return back to a rationale combination of electrons plus molecules. Now it seems to present deviation from the marginal and much politicized view of all-electric electron-based-only “digital, electrical, renewable” future EU energy to a more balanced and, hopefully, less politicized vision of the effective combination of electrons and molecules in EU energy based on decarbonized gas and renewable electricity. I hope that the only distinction regarding their colours would be whether these electrons and molecules are “green” or “non-green” non-dependent the colours of their national flags. Such approach expands the area of prospective Russia-EU co-operation in gas by expanding the area for gas in energy mix. The open question still is whether no-return point is passed in mentality of EU regulators, legislators, politicians regarding gas and its future role? This is why clearly articulated position of K.D. Borchardt is important – it is sort of “litmus test” for the EU. It is important to continue discussions together, on a joint EU-Russia basis, which means implementing not a “zero-sum”, but a “win-win” approach in the quest for a balanced vision of the future role of gas. We are living within the “Broader Energy Europe” and this predetermines co-operation. Though it needs to be understood that Russia and the EU might have different priorities in gas/energy development owing to objective reasons (different state of economic development, import-dependent EU vs export-dependent Russia, mature EU vs developing Russia’s energy market, etc.). So decarbonization (including gas) to such an extent as it seems actual and urgent in the EU might not be the priority of the same importance for Russia, yet… but this discussion has started and shall be continued. See agendas and the Minutes of WS2 GAC/Consultations meetings at www.fief.ru/GAC. See corresponding presentations at the WS2/Consultations meetings at www.fief.ru/GAC. See my numerous publications and presentations on the Quo Vadis issue at www.konoplyanik.ru. Andrey Konoplyanik (AK): Speaking about the prerequisites of the “Clean Energy for All Europeans” package, one can well understand why the EU has spearheaded the (perceived) worldwide move to a decarbonized economy including the fight for “clean energy”. Europe, home to the industrial revolution, was the first region to experience the consequences of “learning by doing” industrialization. They were especially sensitive in this particular region with its high density of population. These considerations have grown in importance when major European countries have reached high standards of leaving and the issues of “quality of life”, including environmental quality, dominate public discourse. But Europe remains import dependent on fossil fuels, both in more/most “dirty” (like coal and oil) and in more “clean” (like gas). So decarbonisation could be considered from environmental, economic and/or political perspectives. Which of these take precedence in EU decarbonisation policies? Moreover, it seems that “clean energy” concept has been evolving in the recent months (at least in the series of your public statements) from the earlier dominant EU vision of “electric-only” world to the more balanced vision of a combined “gas and electric” energy systems, to the merger of the gas and electricity market structures, where gas will not only act as a temporary “bridge” to all electric future and will die at the end of such transition period (which seemed to be the dominant earlier vision in the EU, at least in the most political circles), but will stay as integral part of the common gas and electricity market structure. So what is your current view on decarbonisation as one of the key architects of the EU energy future? Klaus-Dieter Borchardt (KDB): Europe is undergoing an enormous energy transition in order to decarbonize all aspects of our daily lives and this in a relatively short period. The overarching mission is to move towards a zero-emission, carbon-neutral Europe. The pathway is clear: decarbonizing the economy by 2050 in the order of 80-95% compared to 1990, achieving along the way reductions of 40% by 2030 and 60% by 2040. When organizing this transition it must be ensured that Europe's energy supply should also remain reliable, secure and competitive at any time. These are not only crucial elements to ensure public acceptance of the energy transition but form also the core objectives of the European Energy Union. This requires a well balanced mix of energy sources and technologies, more flexible power generation, improved efficiency of energy use, storage of energy and decentralised production. Furthermore, the transition to a widely decarbonized energy sector should be done in the most cost-effective way. Within this process (natural) gas could have an important role to play and act as a facilitator for the integration of renewable energy sources by combining the gas and power infrastructures. It provides flexibility as gas power plants can be ramped up and down quickly and it can be stored. For the long term, however, there is a challenge. If gas is to remain in the EU energy mix, until 2050 and beyond, it has to be successively decarbonized by a shift from fossil to renewable and decarbonized gases. This clearly entails massive deployment of new technologies as well as related costs and likely regulatory changes. The Clean Energy for All Europeans package aims at paving the way for achieving the medium term decarbonisation objectives, 2030. It focuses on the reform of the electricity market design, on renewables, energy efficiency and on sound Energy Union governance. Adjustments to the gas regulatory framework might however be necessary as well. Three issues are of importance: the so-called mirroring, strengthening the Internal Gas Market, reflecting on the future role of gas. (AK): You have mentioned three issues. From my view, the first one requires further clarification, the second one – raises justified concerns about its possible discriminatory character towards key non-EU gas supplier, and the third one can be considered as a prospective area for expanding Russia-EU cooperation in the gas area. Let’s take them one-by one. Let’s start with the “neutral” one. Could you please explain in more details the concept of the so-called “mirroring”? (KDB): I must admit that the term "mirroring" already led to some confusion and misunderstanding. What we mean by "mirroring" is rather simple: we look which concepts and new tools introduced in the new electricity market design by the clean energy package could or even should also be part of our gas market design. This is however not a copy-paste exercise but requires a substantive analysis which measures and provisions would make sense to be incorporated into the gas market and could bring electricity and gas markets closer together. The focus here clearly is on common horizontal topics in electricity and gas legislation, such as provisions on governance, open and fair retail markets, smart grids, smart meters and consumer rights protection (e.g. billing, dynamic prices, demand response, data protection). The "mirroring" also provides the opportunity to streamline the gas legislation by e.g. removing provisions shown to be superfluous after seven years of experience in implementation. (AK):As your second issue, you have mentioned “strengthening the Internal Gas Market”. What do you mean by this? My immediate reaction on this refer to the recent Quo Vadis project that was undertaken through 2017 under the Terms of Reference (ToR) from the Commission’s DG Energy. This will be the item with the potential “negative” consequences among your three issues. We view the Quo Vadis project and its policy recommendations differently: I see negative consequences for Russian gas supplies to the EU and the combined effect of five Quo Vadis proposed-to-be-implemented regulatory scenarios (four of them are numbered: tariff reform, factual and virtual merger of market zones, Combined Capacity-Commodity Release scenario, the fifth is un-numbered – the one which deals with development of pipeline gas infrastructure from coastal EU regas facilities to the central part of the EU where the historical delivery points of Russian gas to the EU have been located) as the “integrated programme” of substituting Russian gas in the area of its historic dominance by imported LNG, first and most, by more costly US LNG. This is proposed to be done by de facto creating artificial economic and administrative barriers for Russian gas, such as: nullification of cross-border tariffs within the EU and compensatory increase of entry tariffs to the EU, reservation of up to 50% of existing and new transportation capacities for the future possible short-term suppliers, obligatory trade of up to 50% in the first entry EU market zone, etc. In sum total, this will decrease current economic competitive advantages of Russian pipeline gas compared to US LNG and will result in higher internal EU wholesale prices. This will lead to decrease of EU welfare contrary to the stated aim in the “Terms of Reference” of the Quo Vadis project to propose regulatory changes, if needed, which will lead to increase of EU welfare. In my view given that the delivery points of Russian gas to the EU lie deep within Europe, the EU cannot develop its regulatory framework based on the “zero-sum game” approach but should base it on the mutually beneficial “win-win” approach within “Broader Energy Europe”. That means considering the justified concerns of external suppliers with fixed delivery routes, unlike LNG suppliers. This means “strengthening the Internal Gas Market” not only stimulates the free flow of gas within the EU but broadening, not narrowing, non-discriminatory delivery roues. This means the more/most competitive gas supplier to the EU (whether it will be a pipeline gas supplier, or a supplier of LNG) wins the pipe gas vs LNG competition which will improve EU welfare. But this is my vision of the Quo Vadis results. What is your interpretation of it? (KDB): Let me be crystal clear: The Quo Vadis study is NOT our pathfinder for improving or upgrading our gas market rules! It is one study among others, it analysis some scenarios which could be interesting to look at with regard to the future gas market. In the first place we did not believe in the necessity to do any gas market rules revision at all. Our gas market rules are working quite well. However, when started to reflect on the future of our gas market, its relation to electricity and to other economic sectors, we also looked into new scenarios. We have also invited other market players and institutions to share with us their ideas and views concerning the future of our gas market. ACER with the upgrade of the gas target model and CEER more recently with the Future Role of Gas study have already contributed to the discussion. (AK): The commonly accepted perception in the business community from the start of the Quo Vadis project has been that it was to pave the way to the Fourth EU Energy Package by presenting to the next Commission draft proposals for regulatory changes based on the assessment of the efficiency of the Third Energy Package in its full integrity (Third Energy Package per se as of 2009 and the following Network Codes and Regulations prepared through 2010-2016 period). Common business concerns relate to the fact that Third EU Energy Package in its full integrity has not yet passed through its “learning curve” and thus has not presented yet its practical application results at the time when Quo Vadis policy recommendations were formulated in end-2017. For example, the first two-year-long implementation cycle of (corresponding “learning curve” for) the Network Code on Incremental Capacities (CAM NC INC) will be finished only in mid-2019, two years after recommendations for EU regulatory changes were presented. So instead of full implementation and improvement, if/when/where needed, of the existing regulatory framework based on Third Package, Quo Vadis proposes, as perceived, to change this framework without adequate practical prove of its efficiency. I appreciate that you clearly downgrade the role of Quo Vadis project and have been presenting it recently as just one study among the others. Nevertheless, this study differs from a number of other studies, in my view: Quo Vadis is the only study which provides not a quantitative assessment of this or that prospective changes based on different assumptions, used as an input for calculation, but which proposes specific changes of the regulatory framework, thus changing the whole business environment. So it will be much more important, compared to other studies, in its consequences for both the EU and the non-EU suppliers to the EU. Can you comment on this, please? (KDB): I do not agree that the Quo Vadis study differs from other studies. Generally speaking you have to distinguish between studies which look more broadly into the policy development (Quo Vadis is part of this category) and those studies which are launched to underpin our impact assessment once the decision has been taken which measures and changes should be introduced and which options are the most efficient and effective once (this implies a more quantitative approach). The policy study necessarily looks in a non-quantitative way into possible options which should be further analysed. Only if we come to the conclusion that we would like to implement the one or the other scenario quantitative studies would need to follow. Therefore, the "value" of the one or the other study cannot be compared as you just did. The Quo Vadis study provides one contribution to the policy debate, that's it. (AK): One of the key debated issues during the 2013-2016 drafting period of CAM NC INC and Tariff Network Code was the issue of so-called “short-term quota” – the share of technical capacity to be reserved for the prospective short-term shippers. The key debated point was: who will pay for it? When the new transportation capacity is considered and the shippers are to book the yet-to-be-built capacity to make it financeable, even 10% quota might create a restrictive economic burden on the project financing of new capacity. But in the Combined Capacity-Commodity Release Scenario presented in the final version of Quo Vadis this share is now proposed to be increased to 50%. Moreover, it is proposed that up to 50% of gas entering the EU shall be traded in the first entry EU market zone. This is not a problem for those pipeline suppliers (like Norway and/or Algeria) and/or to all LNG suppliers who sell their gas in such zones as it is. So such restriction will refer only (?) to Russia pipeline gas supplies. And thus they can be considered as a “tailor made discriminatory measure” against one specific supplier. Can you comment on this scenario/proposal, please? (KDB): I sometimes have the feeling that everything the EU does and which affects Russian gas adversely is according to the Russian view per se "discriminatory". This perception is completely wrong! What we are doing is to look at our own market situation and if we feel that the market lacks competition we are searching for ways and means to fix it. We truly believe in an open and contested market which is the only way to bring benefits to the consumers. Hence the idea to look into the Combined Capacity-Commodity Release scenario:In a sector with only few large third country suppliers and producers, competition may benefit from an increase of the share of technical capacities to be set aside for auctions for yearly or shorter duration (currently 20%). The same increase could be envisaged for incremental capacities (currently 10%). Finally the use of gas release programs could be left to the competence of national regulatory authorities. In this context I cannot see why such a rule would only be affecting the Russian gas supplier; it would be a rule applicable to all external suppliers. But again, this is a scenario we are looking into and we might need to launch more specific studies because the idea of the Quo Vadis study to apply this scenario at the nearest virtual trading point is in my view not working; the same is true for the proposed percentages. Gas release programs have worked in the past quite well but these programs can only solve very specific market foreclosure problems but should not be applied across all European gas markets. In this context I would like to mention another tool which we are investigating currently: a more tailor made regulation based on benchmarking. Overall, the internal gas market is advancing well; however, some Member States are lagging behind. Why not formulating objectives reflecting a functioning market (number of supply sources, market shares of companies, average spread to EU benchmark prices) and encourage those who are not meeting such targets to take effective remedial action? (AK): It seems that proposed solution of “pancaking problem” is based on the “zero-sum” approach and will discriminate non-EU gas suppliers since it is proposed (scenario on tariff reform) to nullify cross-border tariffs within the EU and to compensate such decrease of TSOs revenues by corresponding increase of entry tariffs to the EU from abroad. This will artificially decrease competitiveness of the non-EU suppliers, since will decrease their margin between the commodity price and the costs by the value of increased entry tariff to the EU. How would you comment on this? (KDB): Again you immediately brand the EU-Benchmarking of TSO revenue as discriminatory, but it is not! Reducing the competitiveness of external gas supplying companies as such is not a discrimination. The current setting of tariffs might result in skewed investment incentives, tariff pancaking effects or preferential routing. Therefore, we need to act. To push the tariffs to the entry borders would definitely do the trick. However, such a system would require that we establish at EU level an EU inter-TSO compensation scheme and this is, at this moment in time, mission impossible. That's why this Quo Vadis scenario will not enter into our program for improving our gas market rules. Instead, we consider looking into options for a more harmonised framework incentivising cooperative and more efficient network planning and operation to the benefit of the final customer. (AK):The second issue among your three issues of importance – the Quo Vadis project and its policy recommendations - has raised a number of concerns regarding prospective discriminatory approach to Russian pipeline gas supplies. As for me, Quo Vadis reflects mostly negative thinking on Russian gas in the EU. Conversation on this issue might create mostly the negative flavour among the readers. In contrast, your third issue might broaden, in my view, the area of potential cooperation between Russia and the EU in the gas sphere. Clarification of your vision on it might create more positive flavour of our conversation. This is why I would like to concentrate on your vision of the future role of gas in more detail. I hope this would also stimulate more positive thinking within the EU on future role of Russian gas for Europe. So this item is the one with the most positive to-be-expected consequences among your three issues. Your repeated assertions that future EU energy cannot be only “digital, electrical, renewable” means for me the move (either at your personal level, or within some circles in the decision-making bodies of the EU – please clarify) from the marginal non-economic view of all-electric EU energy to the more balanced vision of combined gas and electric EU future as the most reasonable combination to achieve practical decarbonisation results. This reflects for me sort of “pendulum effect”, when after reaching its margin in deviation from the balanced position, the pendulum began to move into reverse direction, back to the balanced position. Maybe this is what we are facing now in the EU which is reflected in your ongoing statements? Moreover, this move from “electrons only” to “combination of electrons and molecules” vision of the EU energy future seems to reflect prospective depoliticization of the future EU energy development. Why so? It seems that “digital, electrical, renewable” EU concept was developed post-2009 (after second Russia-Ukraine gas transit crisis) based on two key perceptions: that “electrons” are green (since they are renewable) and coloured in the colours of EU national flags (since they can be produced domestically – by local wind and solar). Contrary to this, “molecules” are not green (since fossil fuels are non-renewable) and coloured in the colours of national flags of non-EU states (since EU is import dependent in gas and other non-renewable energies). So it was perceived that the move to “electric only” EU energy based on mostly/only renewable energies would solve both environmental problems of the EU and its import-dependence problems (the issue of the resource rent transfer). (KDB): The main reason for moving towards a high share of renewable energy in the European energy mix are our climate and environmental policies – the import dependency of natural gas is definitely not the driving factor because there was the conviction that natural gas and all other fossil fuels would not remain within the energy mix for long anyhow. And by the way, using renewable energy sources at large scale does not mean that all renewables will be produced in the EU: there will also be some imports. In the meantime and certainly in recent times the perception of the future of gas in the European energy mix has changed. There is now a large majority believing in the future of gas and that gas can play a significant role in the decarbonisation process: Gas is the ideal back-up technology for variable renewables characterised by a high flexibility for balancing the integration of renewable generation (more flexible compared to nuclear production); and by the lowest CO2-intensity of fossil fuels. But there won't be a regulatory phase-out of other fuels at EU-level. The Commission does not promote technology-specific policies, also not for gas. Therefore, for gas to play such a relevant role in the energy mix, it has to win the economic and technological competition. (AK): One of the aspects in the debate regarding prospects of the gas in the EU is the distinction between natural gas and renewable gas. Can you please articulate more clearly such distinction and its consequences for the EU energy policy? (KDB): Indeed, I see a clear distinction between the future of natural gas and green or renewable gas. Natural gas has to win the economic competition especially against coal; this should be possible, supported by the recently reformed Emission Trading System "ETS". Progress has been made to reduce the excessive number of carbon allowances under the ETS, and the market stabilisation reserve should help rebalancing carbon markets. Winning that competition would at least secure the use of natural gas in the short to mid-term as a "bridging fuel" for the development of renewables until 2030/2035. (AK): And for the long term until 2050 and beyond? (KDB): The answer to this question very much depends on whether we believe in an electric only world, where energy is produced as renewable electricity, stored as electricity and all end-applications are switched to electrical appliances (e.g. in the form of heat pumps and battery electric vehicles). In such a world there would be no future for the gas sector as we know it. (AK): Based on your recent public statements it seems that you do not believe in the “all-electric” world. (KDB): Indeed, I don't believe in this electric only scenario. Recent studies have found that this transition to an "all-electric world" is neither technically feasible, nor economically efficient and acceptable to consumers and the broader public. Furthermore, why should we give up gas infrastructure which is well developed in large parts of Europe and has a remaining lifetime far beyond 2050? We would strand assets worth billions of Euros. But the answer about the long term future of gas depends on whether we manage to decarbonize natural gas and develop renewable gases. (AK): What prospects do you see for the decarbonisation of natural gas? And what about the Russia-EU cooperation prospects in this regard? (KDB): For the decarbonisation of natural gas we need CCS (Carbon Capture and Storage). Without this technology it will be impossible to maintain natural gas in the energy mix long term. It does not matter whether this is done by pre-combustion decarbonisation by a reforming process or by a post-combustion process. What matters is that we get zero carbon gas which can use the existing gas infrastructure, pipelines, storage and the distribution grid and appliances in households. I believe that also the Russian gas companies sooner or later have to decide which way they want to go with regard to the deliveries to the European markets. The demand will shift to decarbonized gas and in my view Russia has the potential to respond to this demand by simply decarbonizing at the source, where the gas is extracted. It can then be shipped to the European markets through the existing pipeline system. (AK): Can you comment in more details on your vision of “power to gas”? And what prospects for Russia-EU cooperation do you see in this area? (KDB): Power to gas we need for the development of renewable gases. This is a technology for the production of renewable hydrogen and methane notably in periods with an abundant supply of wind and solar power. It is also the link between the power and the gas infrastructure. It might be the most promising technology for integrating the different energy related sectors of transport, heat production and power generation (so called sector coupling). Power to Gas appears to be the all-in-one solution addressing the crucial problems of the Energy system. Surplus power from wind and photovoltaic can be transformed by electrolysis intro hydrogen and then methane, which can be fed into the gas grid and into existing gas storages. Hydrogen can be produced in a simpler way than methane but methane can be better integrated into the grid (without any restrictions) whereas hydrogen can only be blended up to 10-15%. Choice to be made: either improving the methane production or adapting the natural gas grid to carry hydrogen from renewable sources. Renewable and low emission gases as energy carriers can play a valuable complementary role within the energy transition process. Examples for cost-efficient applications are: dispatchable power generation in systems with a high share of wind and solar power, heating during cold periods (complementing electric heat pumps), heavy duty transport and many industrial processes including steel, fertilizer and other chemical industries. The co-operation in this field is difficult to predict because I simply don't know whether Russia is interested in this technology having in mind the huge potential for producing decarbonized natural gas. However, co-operation and discussions on the future energy systems are always useful. (AK): It seems that you therefore see a hybrid future EU energy “gas-electric” system: zero carbon gases will coexist with electric renewables, contrary to “all electric” vision of the “digital, electrical, renewable” EU energy future, which has been dominating in the EU public domain and maybe still dominates in the EU political vision, at least among populist-oriented politicians. So your vision expands the area of potential (I would like to underline that it is a potential and not a predetermined) co-operation of Russia and the EU in the gas area aimed at not only protecting the current competitive market niche for Russian gas in the EU (at least not diminishing it by artificial administrative measures under “positive discrimination” sign-plate), but maybe for further increasing it on a competitive basis. Such readiness of my country does exist, as you know. But this might come into conflict with the vision of the competitive authorities of the EU on the dominant role of single suppliers, even if their market share is based on their competitive advantages (competitive price level, flexible pricing models, huge available resource base and production and transportation capacities). Moreover, much depends on what methodologies are used to calculate such “market dominance” – whether it is only HHI (Herfindahl-Hirschman index) methodology, which might be good for manufacturing and not as effective, from my view, for mineral resources industries within the world of sovereign states, or some alternative ones, if any. Maybe you may wish to agree that Russia's current share in the EU gas market clearly shows its competitive advantages for the EU against, first of all, global LNG. I fully agree in this respect with the repeated statements of BP chief economist Spencer Dale, made in Moscow, Brussels and/or Washington, that this current market share of Russian gas has been achieved in a competition with other, objectively few, pipeline suppliers to the EU, both of domestic (falling Groningen production) and foreign origin (Norway, Algeria, forthcoming Azeri gas via “Southern corridor”) AND with global LNG. So, in his and my view, Russian gas today has been winning global competition for the EU market. The low utilization level of EU LNG regas capacities clearly proves this. This does mean for me, that if the EU has been developing an open market energy economy, there is no place in it for the artificially-made incremental barriers for the competitive supplies and suppliers. How you see the prospects of such co-operation? Will the decarbonization of Russian gas not face any other limitations (if even under “positive discrimination” sign-plate) for expanding of its competitive niche in the EU? (KDB): Indeed, for the future I therefore see a hybrid system: zero carbon gases will coexist with electric renewables. Our climate target does not require one or the other technology – its achievement will need a balanced mix of energy sources and technologies. What share it will have only the future will show but the hybrid model is not about replacing electric renewables at large scale by zero carbon gases. Because it is uncertain which combination of existing and future technologies will provide our energy services in 2050, one should not exclude upfront any technology from playing a long-term role, and especially not existing gas infrastructure that has been paid for and is capable of transporting large volumes of energy efficiently over long distances. What will be Russia's role here? I believe that Russian gas and Russian gas companies are always welcome on our markets as any other foreign company. But it is also clear that we expect that all market players comply with our rules. In this regard, the mere existence of a dominant position is not as such the problem, but abuses of this position are as we have seen it in the past. From the European side we also regret that huge infrastructure projects like the Southstream, Nordstream 2 or Turkstream 2 are just planned or implemented without coordinating or discussing these huge projects which have an influence on the European markets. This creates, as we currently see, mistrust on both sides which is not a good basis for a trustworthy relationship. (AK): How do you see the prospective role of the Russia-EU Gas Advisory Council in this starting/continuing debate on the future role of gas? It seems to me that such debate will not have to have a role of formal negotiations of the parties but the role of informal flexible discussion to understand the best way to go forward (preferably on the joint/co-operative basis), sort of “testing the water” for possible common undertakings. This is why the depoliticized GAC and its Work Streams are sound places for discussion, even when bilateral relations are poor. What is your view on this? Maybe now it is already time to revitalise the GAC activities, if that will provide additional value to the process, and not only to continue dialogue on the technical level of Work Stream 2 “Internal Markets” as it has been continuing now? (KDB): The GAC has been a very useful tool for discussions and fostering co-operation in the gas sector between Russia and the EU . I am convinced that if the whole EU-Russia Energy Dialogue had not have been suspended because of geopolitical developments in Ukraine/Crimea, a considerable number of problems we are facing today would not have occurred. Therefore, the Energy Dialogue remains an important element in the Russian – European energy relationship. However, until the Russian-Ukrainian conflict is solved in the spirit of the Minsk agreement and the sanctions against Russia are lifted I don't see a revival of the energy dialogue. On the other hand I am confident that once these problems are solved it will be the energy sector with the Energy Dialogue which will help to re-establish mutual trust and beneficial relationships.